Specially designed to handle bulky, medium-to-heavy weight materials. 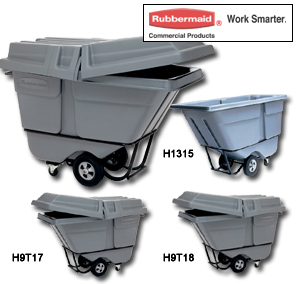 Easy to handle, maneuver and dump contents. Sturdy, plastic construction weighs much less than metal. Smooth surface is easy to clean and resists pitting and corroding. Black in color except H1305-73 which is Blue. Special run colors available -- call for details. FOB Shipping Point. No Lid available for H1035, H1036, H1045, H1046. Product No. Size Cu. Yd. Cap. (lbs.) Size L x W x H Wt. (lbs.) Price Ea.